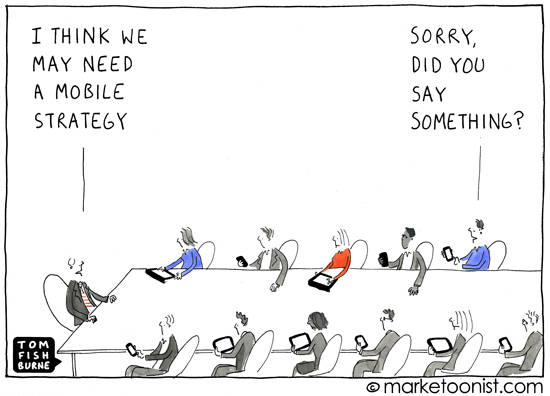 Do We Need a Mobile Strategy? It is quite amazing to me how many customers I visit who are really struggling with how to handle mobile devices, data and applications securely. This week, the following cartoon came across my desk. the funny thing to me is that the cartoon was published in 2011. Here is is 2015 and we still struggle! Recently, I blogged about my interest in leveraging five major converging technologies (Identity, Internet of Things, Mobile, Social and Cloud) to transform my Yellow Jeep into a rolling laboratory, enabling me to experiment with and demonstrate how these important trends can enrich our lives. Instrumenting the Yellow Jeep – What sensors, actuators and control systems can be installed in the Yellow Jeep to monitor the vehicle, provide real time and historical data about its journeys and provide appropriate interaction with the driver and passengers? 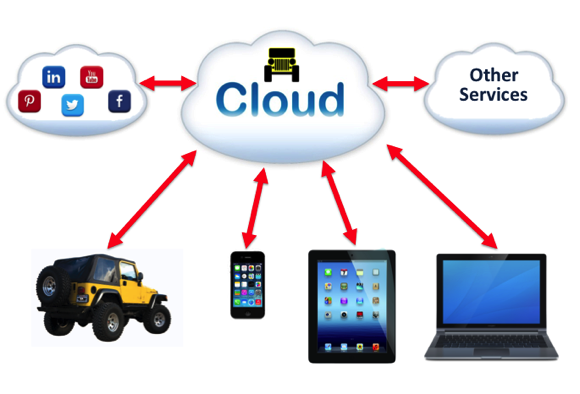 Cloud functionality – What functions should exist in the cloud to receive and store data from the Yellow Jeep, provide appropriate supervisory control mechanisms and data analytics, and support user interface applications? User Interface – What can users see and do via mobile or web applications to trace, interact with and analyze the Yellow Jeep and those who travel with me? In the next few days, I’ll blog about my ideas in each of these areas. If any of you would like to share your ideas, please let me know! I recently launched a personal web site and blog, Yellow Jeep Journey, to provide a personal canvas where I can document my efforts to reach an aggressive weight loss goal, and more importantly, share my experiences in finding personal freedom, light, power and joy along the way. But the Yellow Jeep Journey and Discovering Identity blogs are now coming together in an exciting way. 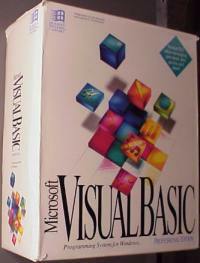 I am exploring how to more effectively integrate my professional pursuits into my quest for personal improvement. I will cross-post my ideas about this pursuit on both blogs. I hope to garner the insight and support of my professional colleagues and associates as I move forward on this exciting endeavor. If you were to take the journey of your lifetime in a Yellow Jeep, how would you customize the Jeep for the journey? Tires? Lift? Engine? Lights? Yep – an integral part of the Jeep Mystique is modifying your own vehicle to suite your individual taste. However, crazy engineer that I am, I have been thinking deeply about equipping my Yellow Jeep in a different way. Of course, the tires and lift will be there, but I can envision more. Suppose I could make my Yellow Jeep into a rolling laboratory of sorts, to test, play with and demonstrate the convergence of some of the most important technology trends in the world today? I have been heavily involved for the last decade in Identity and Access Management technology. It has been a great ride, but I want to explore how to apply that technology in new and different ways. Our world is experiencing great growth and innovation in the areas of cloud computing, mobile technology, social media and the most exciting to me – the Internet of Things. What if my Yellow Jeep could go beyond the traditional Jeep configuration and be equipped with the latest computing equipment and electronics that leverage and even break new ground in these converging forces? Over the next several weeks, I will use this blog to record and refine my thoughts about how to leverage these technology trends to make my Yellow Jeep a powerful and exciting example of how these trends can all be leveraged together to enrich and enlighten our lives like never before. Hope you will come along for the ride! This morning, I was read a recent Oracle White Paper entitled, “Transforming Customer Experience: The Convergence of Social, Mobile and Business Process Management.” It gave interesting perspective on the blending of emerging paradigms – mobile and social – with the older discipline of Business Process Management. To stay ahead in today’s rapidly changing business environment, organizations need agile business processes that allow them to adapt quickly to evolving markets, customer needs, policies, regulations, and business models. … Social and mobile business models have already contributed important new frameworks for collaboration and information sharing in the enterprise. While these technologies are still in a nascent state, BPM and service oriented architecture (SOA) solutions are well established, providing a history of clear and complementary benefits. The term “Social BPM” is sometimes used to describe the use of social tools and techniques in business process improvement efforts. Social BPM helps eliminate barriers between decision makers and the people affected by their decisions. 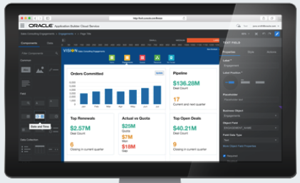 These tools facilitate communication that companies can leverage to improve business processes. Social BPM enables collaboration in the context of BPM and adds the richness of modern social communication tools. … Social BPM increases business value by extracting information from enterprise systems and using it within social networks. Meanwhile, social technologies permit employees to utilize feedback from social networks to improve business processes. 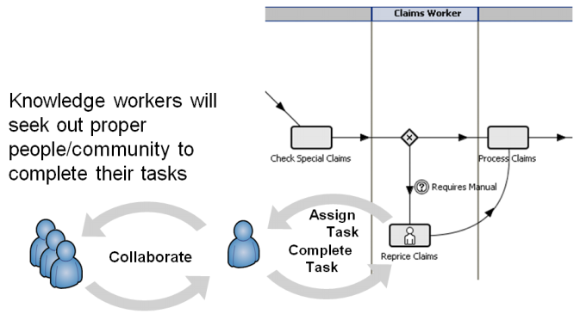 A claims management system assigns a task to an individual claims worker with the expectation that the user will complete the task to advance the process. Of course, to accomplish this type of knowledge-based task, the individual must often engage other people within the business . 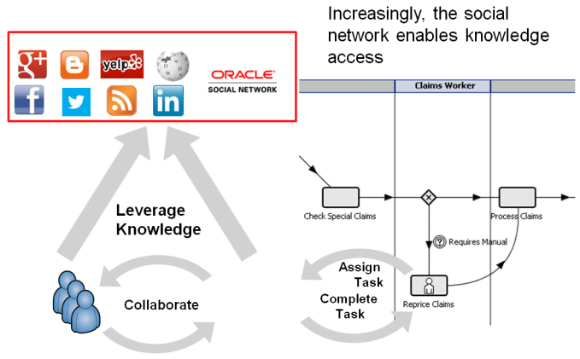 Not only can internal knowledge workers use social networking tools to find each other and share information, but also customers can interact with the process at specific steps, using mobile devices, to supply their own information into a business process. For example, a customer involved in an auto accident might upload photos taken with a cell phone into the process via a claims management app provided by the insurance company. In order to make this all work, participants will need to use both enterprise and social identity credentials. Because they are using mobile devices, the IAM system must accommodate mobile, social and cloud infrastructures in order to effectively use information. This is very much in line with the principles set forth in the Gartner Nexus I addressed yesterday. Research over the past several years has identified the independent evolution of four powerful forces: social, mobile, cloud and information. As a result of consumerization and the ubiquity of connected smart devices, people’s behavior has caused a convergence of these forces. 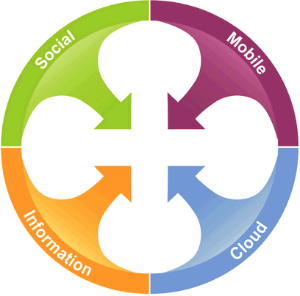 Social is one of the most compelling examples of how consumerization drives enterprise IT practices. It’s hard to think of an activity that is more personal than sharing comments, links and recommendations with friends. Nonetheless, enterprises were quick to see the potential benefits. Comments and recommendations don’t have to be among friends about last night’s game or which shoes to buy; they can also be among colleagues about progress of a project or which supplier provides good value. Consumer vendors were even quicker to see the influence — for good or ill — of friends sharing recommendations on what to buy. Mobile computing is forcing the biggest change to the way people live since the automobile. And like the automotive revolution, there are many secondary impacts. It changes where people can work. It changes how they spend their day. Mass adoption forces new infrastructure. It spawns new businesses. And it threatens the status quo. Cloud computing represents the glue for all the forces of the Nexus. It is the model for delivery of whatever computing resources are needed and for activities that grow out of such delivery. Without cloud computing, social interactions would have no place to happen at scale, mobile access would fail to be able to connect to a wide variety of data and functions, and information would be still stuck inside internal systems. Developing a discipline of innovation through information enables organizations to respond to environmental, customer, employee or product changes as they occur. It will enable companies to leap ahead of their competition in operational or business performance. The combination of pervasive mobility, near-ubiquitous connectivity, industrial compute services, and information access decreases the gap between idea and action. To take advantage of the Nexus of Forces and respond effectively, organizations must face the challenges of modernizing their systems, skills and mind-sets. Organizations that ignore the Nexus of Forces will be displaced by those that can move into the opportunity space more quickly — and the pace is accelerating. While “Social Identity” and “Enterprise Identity” are often now considered separately, I expect that there will be a convergence, or at least a close interoperation of, the two areas. The boundaries between work and personal life are being eroded, with work becoming more of an activity and less of a place. The challenge of enabling and protecting the convergence of social and enterprise identities has huge security and privacy implications. We cannot just focus on solving the IAM challenges of premised-based systems. IAM strategies must accommodate cloud-based and premise-based systems as an integrated whole. Addressing one without the other ignores the reality of the modern information landscape. Mobile devices, not desktop systems, comprise the new majority of user information tools. IAM systems must address the fact that a person may have multiple devices and provide uniform means for addressing things like authentication, authorization, entitlement provisioning, etc. for use across a wide variety of devices. We must improve our abilities to leverage the use of the huge amounts of information generated by mobile/social/cloud platforms, while protecting the privacy of users and the intellectual property rights of enterprises. Emerging new computing paradigms designed to accommodate these converging forces, such as personal clouds, will require built-in, scalable, secure IAM infrastructure. The Gartner Nexus doesn’t explicitly address the emergence of the Internet of Things, but IoT fits well within this overall structure. The scope of IAM must expand to not only address the rapid growth of mobile computing devices, but the bigger virtual explosion of connected devices. We live in an interesting time. The pace of technological and social change is accelerating. Wrestling with and resolving IAM challenges across this rapidly changing landscape is critical to efforts to not only cope with but leverage new opportunities caused by these transformative forces.